Restriction-Box: Does not work with affiliation. Doubles all Rogue Borg and Crystalline Entities in play. Characteristics: Soong-type android, "Continuing Mission"-related cards, "affiliation", Brothers and sisters, Android "species". When either player has this personnel is in play, the STRENGTH of every Rogue Borg Mercenaries in play is doubled, and all numerical features of all Crystalline Entity dilemmas seeded or encountered by either player are doubled (see dilemma resolution). Two Lores in play do not quadruple Rogue Borg and Crystalline Entities. However, Lore and Crosis may each double the STRENGTH of the same Rogue Borg. See Rogue Borg Mercenaries, cumulative. 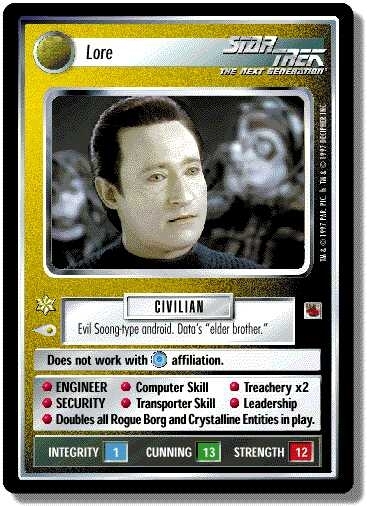 Lore’s nemesis is Dr. Soong, Data, and/or Data and Geordi (dualpersonnel card). See nemesis icon. There are 27 entries for Lore (ST1E 0 UR 12) at the Tradeplace (20 haves and 18 wants). Click here to see all trade list entries for this Ultra Rare card! Also see here for all trade lists with any card fom "The Fajo Collection".